You may wonder what is a liqueur? What makes it different from just any old liquor*? Merriam-Webster defines liqueur as: "a sweetened alcoholic liquor (such as brandy, whiskey, vodka, etc) flavored with fruit, spices, nuts, herbs, or seeds". You can also add cream or milk products to produce a cream liqueur such as Irish Cream. There is a subset of liqueurs called cordials and these would be the liqueurs made with fruits and/or fruit juices. Distillation - where the flavoring elements and the spirit are blended together and then distilled**. Maceration - where the flavoring ingredients are mixed with the alcohol and allowed to infuse together. Infusion - where the flavoring elements are "infused" with hot water to release their natural flavors then mixed with the alcohol. Percolation - where the alcohol is pushed through the flavoring agents to absorb their flavors. Grand Marnier - a combination of cognac and orange. Cointreau - a combination of brandy and oranges. Drambuie - a combination of Scotch whisky with heather honey and herbs. Triple Sec - an orange flavored liqueur made from the dried peels of bitter and sweet orange. Irish Cream - a combination of whiskey, cream and flavorings (usually chocolate and coffee). Chambord - a blend of black raspberries, cognac, berry and fruit extracts and proprietary spices. Southern Comfort - a blend of bourbon, orange and peaches. Kahlua - a sugar cane (rum) and coffee liqueur. You can make a ton of your own liqueurs. Some are extremely easy and take only a little patience, time and work. To make your own liqueurs you simply combine a base liquor with a flavoring ingredient to which you may add a sweetening ingredient. RASPBERRY LIQUEUR VANILLA BEAN LIQUEUR There are tons of recipes online for homemade liqueurs, including the famous liqueurs you pay a nice chunk of change for. 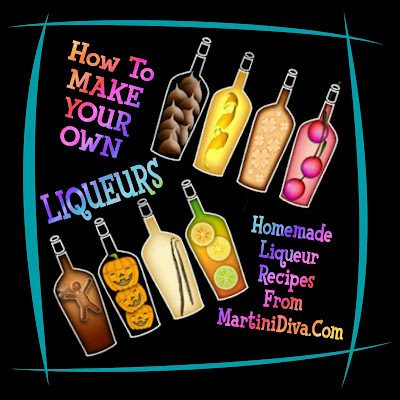 Don't be afraid to experiment with making your own customized liqueurs. Try a combination of your favorite fruits, spices, herbs, nuts, even add some cream if you want. Just remember that if you add creams or milk products you will want to keep your liqueur refrigerated and drink it up fast as these liqueurs (homemade AND store bought) do have a shelf life and require refrigeration. Homemade Liqueurs made excellent gifts too! **Distillation: the process of separating, concentrating, or purifying liquid by boiling it and then condensing the resulting vapor.